If you are considering whether to deploy Microsoft Lync internally, evaluating a Hosted Lync offering, or even considering how Microsoft Lync will impact your organization long term – this post is for you. Deciding how much bandwidth is required for your hosted Microsoft Lync Implementation requires a review of your general communication infrastructure. There are several things that can influence how much bandwidth you will need. To Begin – these guys created a great tool to calculate specifically what you might need: Hosted Microsoft Lync Bandwidth Tool. There are multiple types of communication and scenarios that Hosted Microsoft Lync uses bandwidth. In order to give you a good idea of how much bandwidth you will need we will need to know two sets of data – how many employees and which of these scenarios you will be using Lync. So essentially – we will need to look at the Audio, Video, and Conference Requirements to give you a good idea of how much bandwidth you will need for Hosted Microsoft Lync. The most significant factor we have found in using Microsoft Lync involves the number of employees who will be sharing the connection and the type of work (screen shares and webinars take a lot more bandwidth than phone calls). Make sure you count remote or home office workers. Generally we would recommend about 100kbps for each of the first 10 users or about a T1 line. As you get above 10 users you will start to gain some efficiency on the voice side – but not so much on the video. Here are three charts based on how you see usage in your company. Click here for a full description of the various types of internet connections. What type of connection do you need for Hosted Microsoft Lync? For most companies – general internet connectivity will be fine. All of your data will be encrypted and secured between your employees (wherever they are) and the Cloudworks Hosting facilities. For some clients who want a completely private connection – we can deploy an MPLS or EVPLS type solution and lock down routers and firewalls at your work place so that they can only talk to the Ongoing Operations hosting facility. Either scenario is acceptable. What other services are running over your Bandwidth? The chart above assumes that you are running over your bandwidth is Hosted Microsoft Lync. It you have other solutions and requirements that leverage that same connection, you will need to consider the impact. For example, if you use Hosted VOIP or Virtual PBX or Hosted Virtual Desktops than each service will place some requirement on the connection like the hosted microsoft lync. If that is your scenario than you will need to plan for additional bandwidth for hosted Lync. You may also want to do some offsite data vaulting or something else that consumes your local bandwidth. Ongoing Operations is happy to help evaluate and review what traffic is currently on your connection as part of your Hosted Lync evaluation. Sadly – all internet is not created equal and can greatly impact your success in using the cloud or Hosted Microsoft Lync. In general if an internet connection is being used for browsing the web – the quality can be pretty low as a few millisecond delay is not really noticeable to humans or the performance. In Hosted Microsoft Lync however, that same millisecond delay can be very frustrating. Video and webinars may require your local screen to be refreshed from the cloud very frequently. Any delay results in a screen flash or pause. For the vast majority of our clients – this is a non-issue and the benefits far outweigh the occasional flash. For those with poor internet connections – it is a terrible experience. As part of your evaluation – we can look at your existing connectivity provider and determine how much latency (or delay) and if their is any packet loss on the connection. If either the latency or packet loss is high – we may recommend a different carrier or solution to ensure a good Hosted Microsoft Lync experience. We highly recommend monitoring your connectivity before and after you implement hosted Lync. Tying your network into the Cloudworks monitoring tools is relatively easy. Once done – we will provide alerts and notifications if you start hitting 80% utilization or we see increased latency or packet loss. We aim to be very proactive in this regard to make sure your Hosted Lync continues to work well into the future. Want to learn about how Hosted Microsoft Lync pricing is determined? 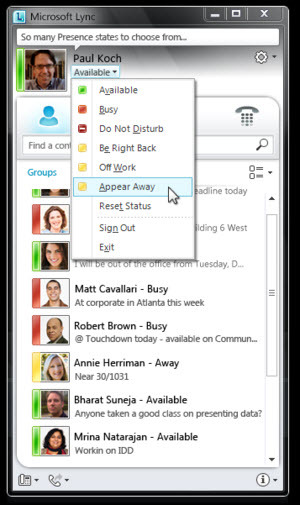 Interested in reviewing Hosted Microsoft Lync Features?